It has been a productive weekend in terms of the trailer. 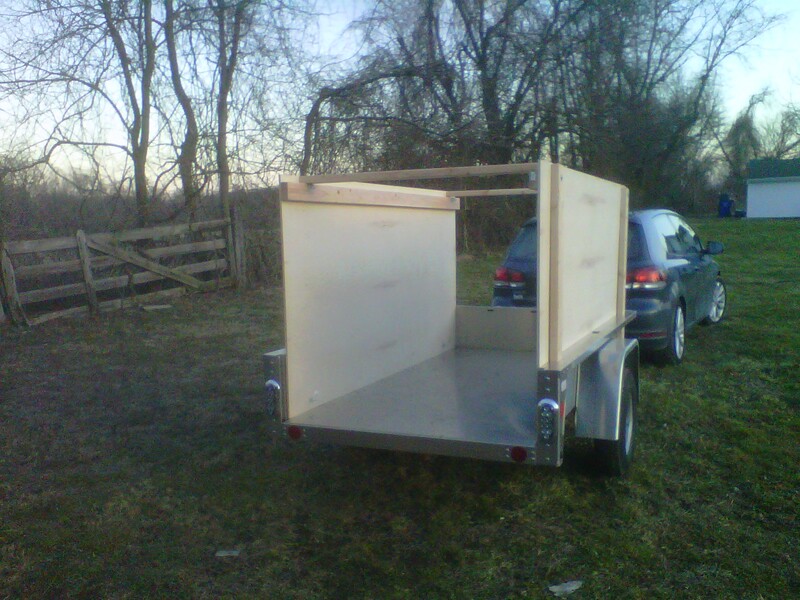 I made some room in the shed, visited the nearest Home Depot, and after a few hours of trail-and-error, I have my first trailer camper prototype. View from the front quarter — the VW sure is a cute little car (that needs a wash)! This size utilizes standard pieces of plywood for the sides and top, and one piece ripped in half lengthwise for the front and back. The box design maximizes interior volume given the floor dimensions and is my best chance of being able to sleep inside. I wanted to get a feel for how much space this would be inside before thinking about a design which would result in less space. I knew that it would be a little bit taller than the car and I wanted to see how much wind resistance would be generated by a flat front. In my test drive, I could feel some wind resistance, but overall the little diesel engine didn’t seem to mind at all. I’m pretty sure I don’t want to throw my canoe on top of this though! 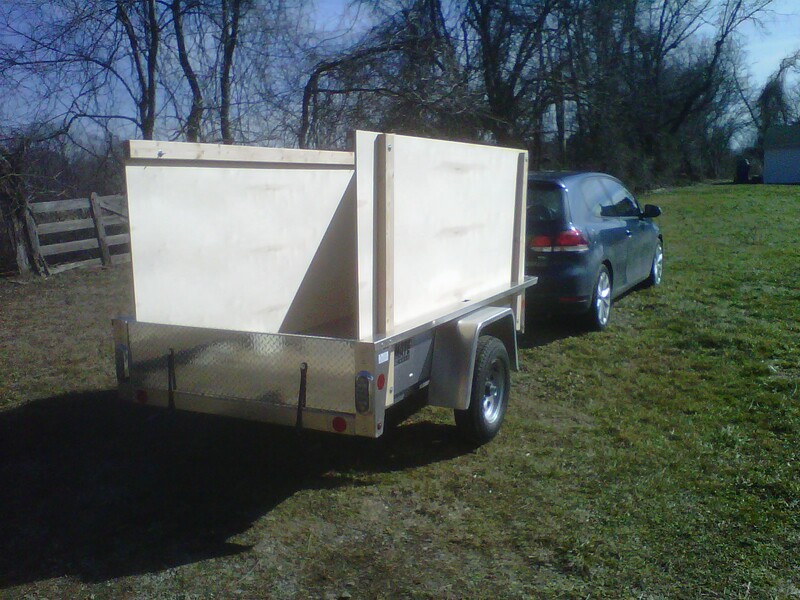 A square box is pretty easy to build, even for someone like me who has never done any building other than mending fences (although I admit I have a very, very long way to go — this is a pretty f’ugly trailer so far). View from rear quarter – trailer looks a lot bigger from behind! Regular 2×4″ studs and 1/2″ thick birch 8×4′ plywood sheets. This type of plywood seemed to be a good compromise between strength, cost, weight, and looks. I could either apply some sort of water sealant to protect against moisture and UV damage or simply switch to marine plywood once I’ve got the final design figured out. 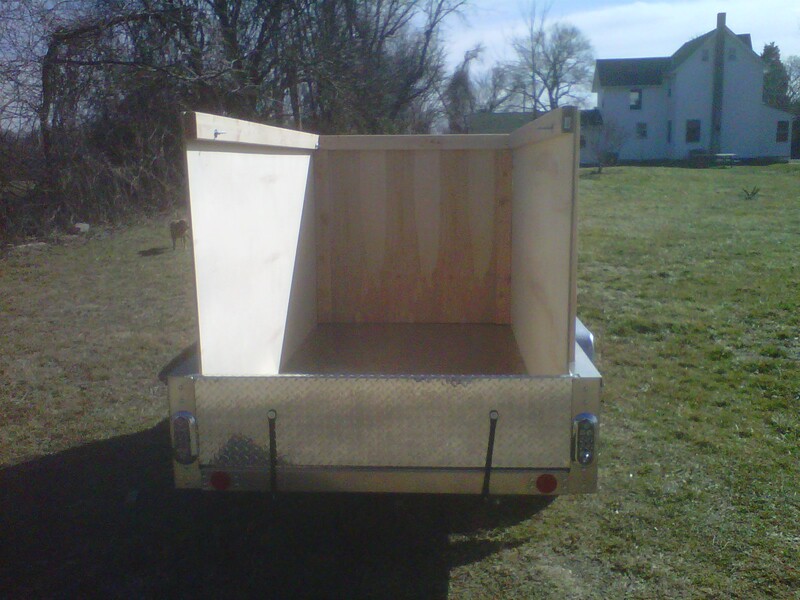 2×4’s through the side stake pockets bolted through small holes in the aluminum sides help to snug the plywood against the inside of the trailer walls. 2×4 across the top of the side walls to provide stability and something solid to attach the roof. A 2×4 frame around the front wall. 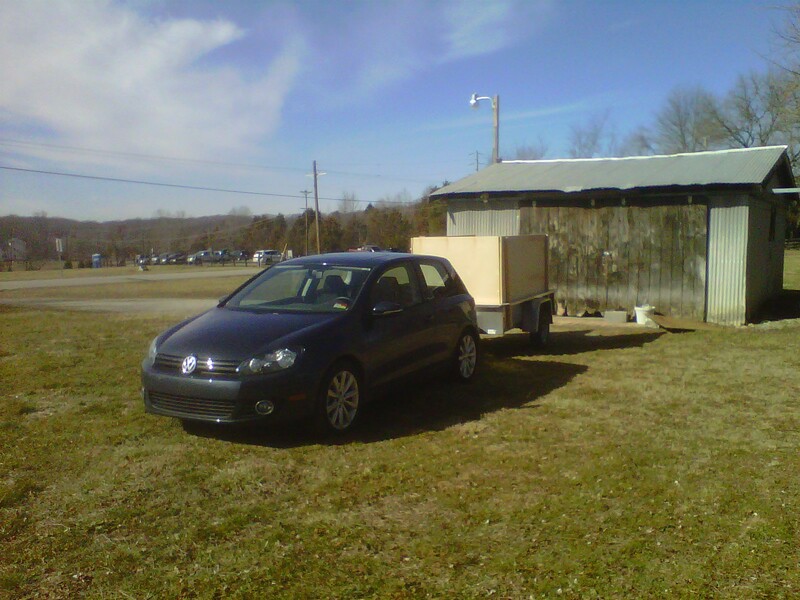 It turns out that the trailer bed is slightly wider than 4′ so there is small gap between the front wall and the sides. This is fine for now, but would let water in for sure. I will cut a piece that will fit all the way across the front so that the ends of the side walls are covered; this should help with keep water out. I haven’t tried a roof or back yet because I’m still considering a few options. I just wanted to get something out on the road as an initial test. A view inside — bonus points for finding Roxy-dog! There is plenty of room for camping gear! Can you picture a platform for an air mattress about halfway up, with bed on top and camping gear in plastic tubs below? I can. I could easily fit a double-sized air mattress in there (another good answer to this question). I was thinking that if I put a small space heater under the bed platform, the heat would collect up where the bed is and be a lot warmer than it has been in the tent. I really would like the ability to sleep in here for bad weather and when I don’t feel like setting up a tent. On the test drive, the car did great. It is strange looking out of the rear-view mirror and seeing nothing but plywood. However, the camper box is slightly narrower than the car and so I had good rear visibility from the side mirrors. I got it up to 55 mph and noticed that the sidewalls were wiggling wavering slightly. Given how little support is built in so far that’s not a big surprise. The next updates in terms of support would be to add center exterior vertical supports (there is one more stake pocket on each side) and add a horizontal support about halfway across the middle of the interior. That support would be bolted through the exterior vertical supports, sandwiching the plywood wall in between with the trailer wall for support. Finally, adding the support of a roof will help to stabilize the sides. Once the design is finalized, I would also be gluing everything together. All of those improvements should make it substantially stronger. Figure out a roof. I’ve thought about having a roof that pops up a little so that there is more headroom inside. I have a couple ideas and now that I’ve got a basic frame I can evaluate them better. But I’ll probably start with a simple flat roof. Test out a V-nose. I think that there is room to install a small V-nose on the front, but the front aluminum wall of the trailer might get in the way. The V-nose should cut down on wind resistance and increase gas mileage at highway speeds. If this works, then I may end up keeping the big box shape. Figure out a door for the back. There are several options here, especially considering that I could incorporate the small tailgate that came with the trailer into the design. It makes sense to figure out the height before thinking about this. That’s it for now. It is really fun to finally be building this — I’ve been researching and thinking about something like this for a couple of years! After writing the above, I realized how to better set it up for a roof. I dropped the inside studs down enough to accommodate studs going across the top (had to pop off the front assembly for this). That was easy – duh! Then I dropped the last piece of plywood on the top to simulate a roof. Stuck the front back on (it wasn’t attached which is why it is leaning) to see what it would be like inside. Not too shabby at all. Note that the plywood sheet is not quite wide enough and is not attached – that is why it looks a little wonky. Things to remedy soon! Seems plenty big to me! 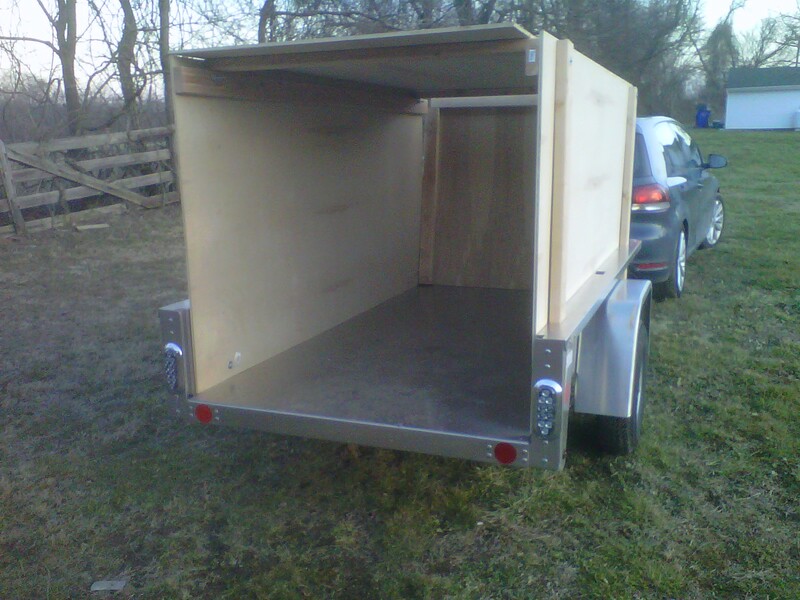 This entry was posted in Prelude / Getting Ready for the Road and tagged Planning and Testing, Trailer building. Bookmark the permalink.